Electric car company Nio's second day on the stock market was a lot more spectacular than its first. Shares in the Shanghai-based rival to Tesla (TSLA) jumped a staggering 76% in New York on Thursday. At one point in the day, the stock was up 92%. The spectacular leap is remarkable after Nio (NIO) had to scale back the size of its IPO. It raised $1 billion from the offering, at the bottom of its price range. It was hoping to raise as much as $1.8 billion. On its trading debut Wednesday, Nio stock closed up 5%, having plunged as much 15% earlier that day. 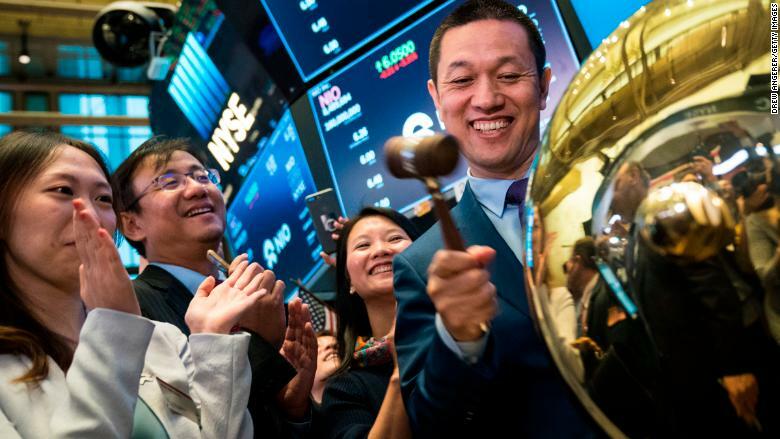 The company's chief financial officer, Louis Hsieh, told CNN on Wednesday that the timing of the company's IPO "was not excellent," pointing to the bear markets for stocks in Hong Kong and Shanghai. An investor relations representative for Nio declined to comment Friday on movements in the stock price. Its stunning gains came on a strong day for Chinese tech stocks listed in the United States. E-commerce firm Pinduoduo (PDD) leaped 30%, video site iQiyi (IQ) popped almost 6%, and gaming and media company NetEase (NTES) jumped more than 5%. 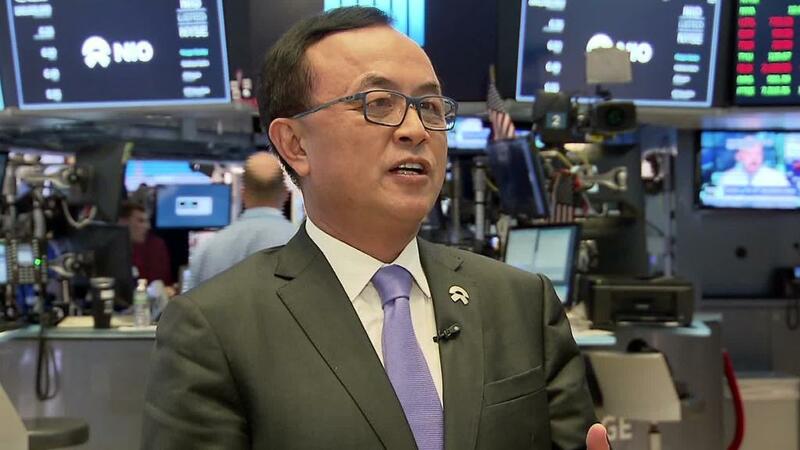 Nio CEO William Bin Lee at the New York Stock Exchange on Wednesday, the first day of trading for the company's stock. Nio's ES8 electric SUV, which was unveiled last year, sells for about $65,000, or about half the price of the most basic version of Tesla's Model X in China. At the end of July, it had 17,000 vehicles on order from customers, but had delivered fewer than 500, according to a regulatory filing for its IPO. In the first half of this year, it recorded just $7 million in sales, posting a loss of $503 million. It's entering a very crowded market. Besides Tesla, Nio faces competition from Chinese manufacturers including Warren Buffett-backed BYD (BYDDF) and Byton. Global carmakers including Volkswagen (VLKAF) and Ford (F) are also ramping up plans to develop electric cars specifically for the Chinese market. Some analysts are skeptical about Nio's chances of success. Robin Zhu, an Asian auto industry expert at investment research firm Bernstein, put an "underperform" rating on the company's stock on Thursday, equivalent to advising clients to sell. He said the company will struggle to meet its ambitious sales targets and is selling its cars too cheaply to make sufficient profit. Zhu thinks the stock is worth about a third of its current price. "We're unconvinced Nio's shares represent a sound investment," he wrote.